Losing a loved one is not easy. But the untimely loss of a loved one caused by the negligent or reckless acts of another person or entity can be intolerable. If you have experienced such a terrible loss, the last thing you may want to deal with is talking with an attorney to protect your legal rights and filing an action against the wrongdoer who caused the accident. However, taking legal action can bring a sense of closure and justice, as well as helping you financially more stable so you can properly grieve the loss of your loved one. 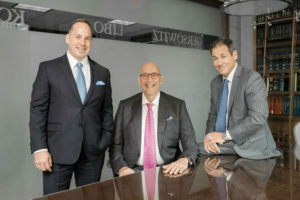 At Gersowitz Libo & Korek, P.C., we build upon 30 years of experience and resources to deal with the legal matters of the wrongful death of your loved one so that you can concentrate on dealing with your loss. Our experienced and compassionate NYC wrongful death lawyers treat each client with the dedication and respect they need in dealing with such delicate wrongful death matters. There is a personal representative appointed to bring suit on behalf of the decedent’s estate. In other words, if our NYC wrongful death lawyers are able to prove that you will experience severe future emotional and financial hardship as a result of the untimely death of your loved one, you will be entitled to monetary damages for the loss of your loved one. Our experienced legal team will look at your specific situation to determine exactly who is entitled to file a wrongful death claim to seek monetary compensation for the loss of a loved one due to the negligent or reckless actions of the at-fault party. We have more than 30 years of experience handling such cases. We understand how hard it is to lose a loved one. While we are aggressive in handling the legal aspect of our clients’ claims, we are compassionate in dealing with our clients and providing them with the understanding and care they need during such a tragic period in their lives. The value of loss of love, companionship, comfort, affection, society, support and consortium of the decedent. The value of loss of financial support that the decedent would have provided had he or she not died. The value of loss of services provided around the house, such as housekeeping, cooking, shopping, and cleaning. Additionally, if the claimants are minor children, they may be entitled to damages for loss of nurture, intellectual and physical training, and such instruction and care that only a parent can provide. Although no amount of financial payment can ever compensate you for the loss of your loved one, being financially stable and secure in your future can provide you and your family with a sense of closure and security. At Gersowitz Libo & Korek, P.C., we will guide you through the legal process and help you obtain the full compensation that you are entitled to. A $2,750,000 settlement on behalf of the family of a young jeweler and musician who died as a result of the hospital failing to perform timely surgery after the victim was innocently shot in a hold up. A $2,500,000 settlement on behalf of the family of a hospital patient who was exposed to Legionnaire’s Disease while seeking treatment for an unrelated medical condition. A $2,500,000 settlement on behalf of the family of a woman who died during a negligent C-section performed during childbirth. She left behind a husband and six children. A $2,500,000 settlement on behalf of the family of a young woman who was struck by a motor vehicle and was misdiagnosed with a subarachnoid hemorrhage. This is only a small list of wrongful death settlements we have obtained for our clients. If someone you love has died in New York or New Jersey as a result the negligent or reckless actions of another party, you may be entitled to make a wrongful death claim. The NYC wrongful death attorneys at Gersowitz, Libo & Korek, P.C. have a more than 30 years of experience representing wrongful death cases, including those entitled to bring wrongful death claims against individuals and corporations. We can help you get the compensation that you deserve. For more information or to schedule a complimentary consultation, call us at 1-800-529-9997 or fill out a New York Personal Injury Case Consultation form. We handle personal injury cases in New York and New Jersey. Do I Have to Pay Taxes on a Death Settlement ?